Sexagesimal is the base 60 number system, used by the Sumerians and the Babylonians, that still survives today in our units of time (60 seconds in a minute, 60 minutes in an hour) and measure of angles (360 degrees in a circle, arcminutes, arcseconds). No, I'm not actually endorsing raising children to be more familiar with a sexagesimal system than the decimal system, but can't you imagine a book title like this, with some sort of silly argument about the value of tradition? It is fun to spend some time making arithmetic rules for different bases, though. Take hexadecimal for example. Sixteen digits: 0, 1, 2, 3, 4, 5, 6, 7, 8, 9, A (10), B (11), C (12), D (13), E (14), and F (15). Therefore, the "tens" place is actually the "sixteens" place. For example, 10 is 1 x 16 + 0, and 21 is 2 x 16 +1. This means that you can count up to fifteen-16s in only two digits: FF is 15 x 16 + 15 = 255. Thus, the "hundreds" place is actually the "256th-s" place. In hexadecimal, 100 is 256. One of my favorite t-shirts, which my wife won't allow me to buy, reads, "1 in 100 people understand hexadecimal. The other two hundred fifty-five just stare at you." The place values continue the same pattern: the "ones" digit is multiplied by 16^0, or 1; the "tens" digit is multiplied by 16^1, or 16; the "hundreds" digit is multiplied by 16^2, or 256; the "thousands" digit is multiplied by 16^3, or 4096; and so on. Now we can start to make an addition table! Does our standard old algorithm for adding multidigit numbers work? Let's try adding 1C + 59. First, tackle C + 9. Our table says the answer is 15. Put the 5 down, carry the 1. Now in the sixteens place we have the carried 1 plus 1 + 5, so 7. Our final answer is 75. Is this right? To check, convert everything into decimal. 1C is 28, 59 is 89, and 75 is 117. And yes, that's correct, so the standard old algorithm works regardless of the base of the number system. Now we can try our standard old algorithm for multiplication. Let's do 1C x 59. First, separate it into 1C x 9 and 1C x 50. So, C x 9 is 6C, from the table. I write down C in the ones place and carry the 6. 1 x 9 is 9, then add the 6, so 9 + 6 is F. This means 1C x 9 = FC. I repeat the process for 1C x 50, making sure to write down a 0 in the ones place. This yields 1C x 50 = 8C0. Now, the final step is to add FC and 8C0. I get 9BC, so my final answer is 1C x 59 = 9BC. Is this correct? To check, convert everything into decimal. 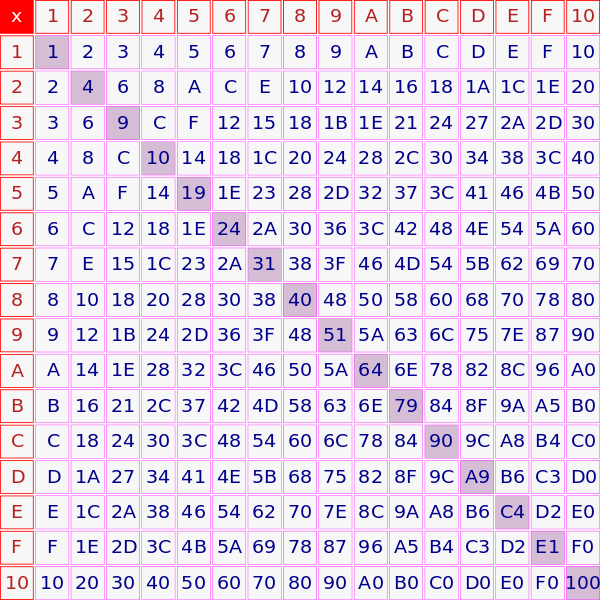 1C is 28, 59 is 89, and 9BC is 2492. And yes, that's correct, so the standard old algorithm for multiplication works regardless of the base of the number system. All of this is pretty darn neat. Here is a great trick I got from Cathy Varner for binary. Binary works with only two digits, 0 and 1, so 2 is represented as "10"; i.e., 1 * 2^1 + 0 * 2^0. Every number can be represented by adding some combination of the powers of two: for example, 11 is represented as "1011" -- 1 * 2^3 + 0 * 2^2 + 1 * 2^1 + 1 * 2^0. The trick is to ask students to think of their birthday (the day of the month, 1-31), then use a series of cards to figure out the binary representation of their birthday, and then "guess" it correctly every time. For example, the first card includes all the odd numbers (1, 3, 5, etc.). If the student says "yes, my birthday is on this card," I know the ones digit, the 2^0 digit, is "1", not "0". So in this case, I keep a +1 in my head. 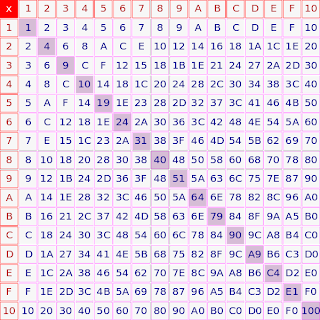 The second card includes every number where the second digit in binary, the 2^1 digit, is "1", not "0". So if the student gives a "yes, my birthday is on that card," I keep a +2 in my head. I also have cards for the 2^2 digit (+4), the 2^3 digit (+8), and the 2^4 digit (+16). Since 2^5 = 32, I do not need this card. The highest birthday number is 31, which in binary is "11111" -- that is, +1 +2 +4 +8 +16. This shows you what numbers to put on each card. The students answer yes or no, and all you need to do is keep a running tally in your head. Making the card is the only challenging part! I came up with a powers of three trick. I ask them to think of a number from 0-26: age of a sibling, perhaps. I show them these three cards, and ask whether the number is present in black, in red, or not present. Can you see how it works?